노동과건강 - ‘Shipyard ghost story’, the same death in 2014 as 1994 again? ‘Shipyard ghost story’, the same death in 2014 as 1994 again? At 2:20 pm on 14th May, Mr. Gwangwoong Kim (45) who worked for Painting team1 of Hyundai Heavy Industry (refer to as HHI below) collapsed. His supervisor found him groaning and transferred him to a hospital but he passed away. Kim at that time was on the painting job in cargo with his colleagues. His 4 co-workers were painting inside of the cargo and he was holding an air-pump hose outside of the cargo window. It started heavily raining about an hour after they started working. He was worried that the job inside might be delayed by rain. He looked inside through the space between hatch cover (cargo window cover) and hatch coaming (the surface where ship meets hatch cover). He was killed mysteriously at that moment. Under the circumstance, it was thought that his body was stuck as the hatch cover was suddenly shut. When needed to operate hatch cover, a signaler should be placed and operate by signs but they didn’t and the incident followed. Working in the rain to advance the completion date was another contributor. Kim had two young daughters. Mr. Gyeonghwan Lee (33) was cleaning the inside of hatch cover with his 2 colleagues from 8 am in the morning on 25th October. They finished the work after 30minutes. Then, the head of the working group came to the site and sat on the cockpit to close hatch cover. The head shouted “Closing”, then, closed the hatch cover. However, Lee wasn’t aware of this and moved to his working station with a washed crowbar. The one who saw this shouted back “Don’t close” but the operator understood this as okay to close and closed the hatch cover. Lee’s left skull was fractured and he died on the spot. As the open and close of hatch cover involves risks, the guideline mandates to have at least 3 safety personnel in the work place but obviously, they didn’t and the incident happened. Signalers should take a thorough look around by the operator’s instruction and conduct safety checks. Then, the operator should open or close hatch cover by a sign of signaler if there is no safety issue but signs were not in accordance due to the shortage of staff. It had been only 3 months since Lee joined the HHI’s subcontracting company. He had a 3 year old son. Both the caThe cause and place for death were the same. The only difference is the victim in 1994 was a HHI’s employee but the one in 2014 was a subcontract worker. These ‘deaths’ were not limited in one-time incident but the ‘conventional fatalities’ are being repeated. According to Ulsan Industrial Accident Free Association, 22 workers were killed in 1974 building ships. 19 in 1975, 15 in 1976 and 23 in 1977 were killed. Since then, it seemed the number decreased. 12 in 1978, 17 in 1979, 17 in 1980 and 12 in 1981 were reported but they were still double figures. It was 1985 that the number came down to a single figure and it was maintained since then. From 1990s, subcontract workers started dying since it buckled down to labor outsourcing. However, the type of death was almost identical. The only change was the victim, from permanent employee to subcontract worker. In particular, Mr. Yun was killed by stricture between a crane and column in December 1992.Mr. Seo died from a fall in February 1996 and Mr. Moon also by stricture. Mr. Kim and other 3 were killed by a block flipped over. The causes of death were similar in 2000s; fall, stricture and suffocating. One fell down to his death as a basket latched onto the scaffold’s handrail and another fell during a cleaning job. Another died from a fall by a block that flipped over. There were uncountable injuries on top of these. The difference compared to before 2000 was all these fatalities were occurred by subcontract workers. Repeating deaths, is this HHI only? The attention point is that these ‘conventional injuries’ are not limited to only HHI. 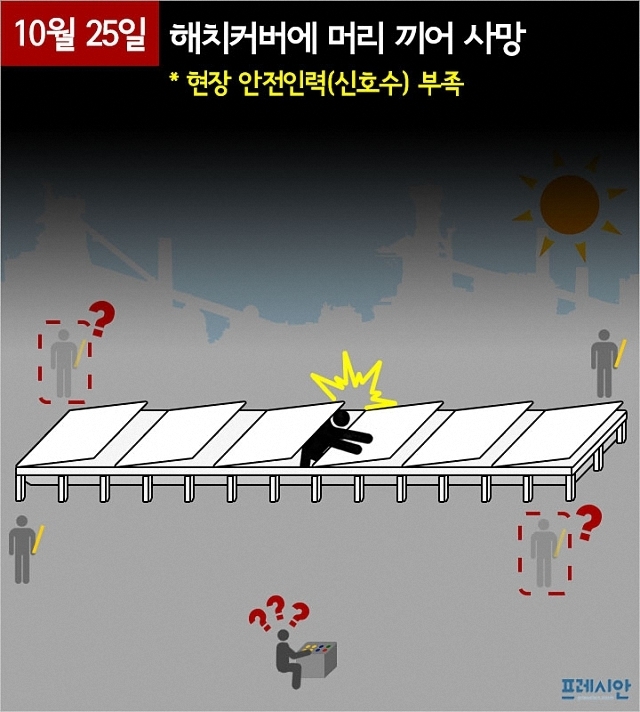 According to ‘The statistics of Major shipyards’ critical occupational incident’ summarized by Metal union, 51 workers were killed from 1996 to 2013 at Daewoo Shipbuilding and Marine Engineering (DSME). Most were killed by conventional accidents such as fall (16), crush (15) and explosion and suffocation (10). 23 workers also died in Hanjin Heavy Industry from 1995 to 2010. 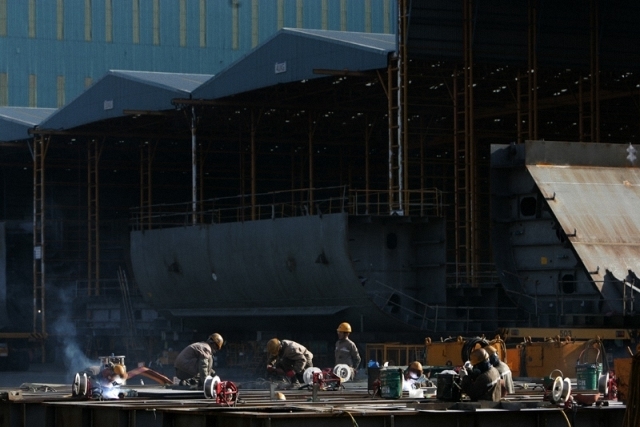 At Sungdong Shipbuilding and Marine Engineering, 15 were killed by critical incidents between 2002 and 2014. Again, traditional accidents. Mr. Semin Park, Health and Safety director at Metal union said, “About 400 workers were killed by suffocating, fall and fire etc. at HHI since the company was founded and it was because even basic safety actions were not taken. Since the labor has been outsourced since 2000, the job title is different from employee to subcontract worker but the structure that workers die on the job is still the same”. He also said, “The type of frequently occurred incidents were carbon copies from the early days of HHI and this is being occurred not only at HHI but also other shipyards”.